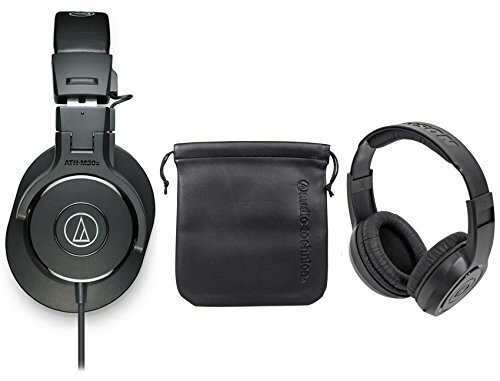 Audio Technica ATH-M30X Professional Studio Monitor Collapsible Headphones . Advanced build quality and engineering. 40 mm drivers with rare earth magnets and copper-clad aluminum wire voice coils. Tuned for enhanced detail, with excellent mid-range definition. Circumaural design contours around the ears for excellent sound isolation in loud environments. Convenient single-side cable exit. Collapsible for space-saving portability. Hear the Difference: Samson's SR350 Stereo Headphones provide quality bass performance and excellent sound isolation in a lightweight, over-ear design. The wide cushioning on its ear pads and adjustable headband provide serious comfort, while a low-profile fit makes the SR350s ideal for everything from home listening to fitness applications.. Ear Bud Upgrade: The SR350s are a solid introduction to the superior audio quality provided by over-ear headphones. They make an excellent gift for the music lovers still using their supplied smartphone ear buds.. .
Lightweight Listening: Featuring all lightweight components, the SR350s are ideal for a mobile lifestyle. Perfect for a variety of fitness and travel applications, these headphones offer hours of ultra-portable, fatigue-free listening for even your longest listening sessions..